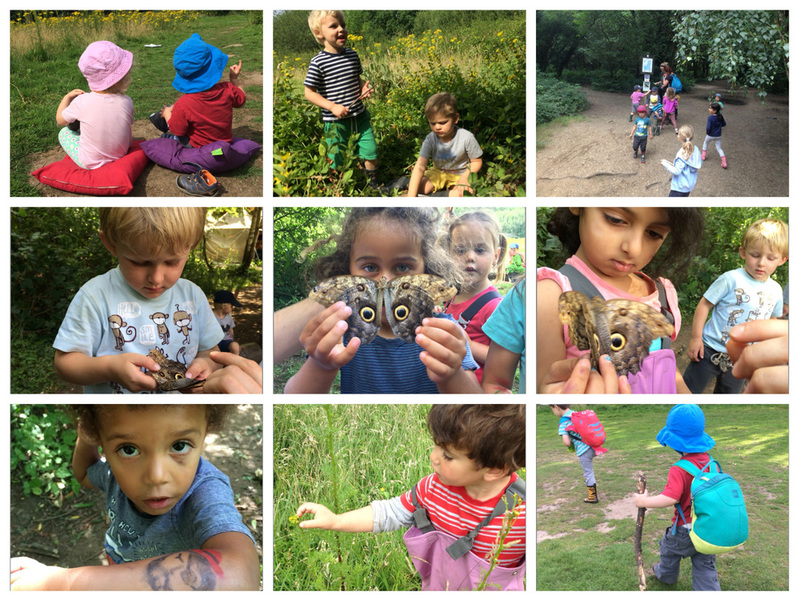 What a fantastic week we have had in the forest! It was the start of our holiday camp weeks and we have all had so much fun getting to know some new faces, and welcoming back some old friends. Our regular children seamlessly welcomed all the new children and included them in all of their games, which was so heartening to see. We already know that LFF has got such kind and friendly children but it’s times like these that they really shine and make us all feel so proud. We have had lots and lots of pirate-y fun as we explored this theme in many of different ways. 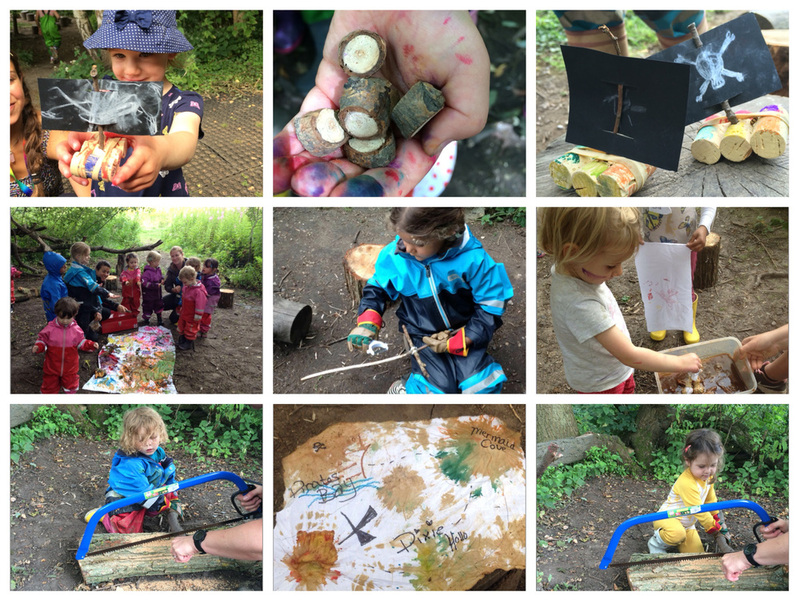 We have used our motor skills and showed great concentration and listening skills as we used a bow saw to cut logs for various purposes… we have made pirate ships, medallions and treasure galore! In addition to all of this we have, as always, enjoyed lots of wonderful child-initiated free play. We have been climbing, running, rolling, laughing, singing, spinning and splashing! The number of caterpillars in the meadow seems to have doubled over the past week and this is still a strong interest for lots of children. We have been caring for caterpillars all week long and had the added bonus of some very special butterflies to look at. A visitor to the site brought with him some perfect and beautiful dead butterflies and empty cocoons from the National History Museum’s butterfly exhibition. We learned the name of the ‘Pale Owl Moth’ and took turns to gently hold these precious creatures. This was such a special experience and allowed to discuss the life cycle of these animals in a way that is really meaningful to the children. This week we say goodbye to Fiona and wish her well in her future travels. In the next 10 days we have two new additions to the team making their debut. Stephen will be joining us as a practitioner to replace Fiona. He already seems to have a great reputation and fans in the forest as those of you attending the day he did his interview and trial with us recognised him as a bit of a superstar local childcare practitioner from his nanny-ing days in Wimbledon. We also have Taylor joining us to take over from Antonio as our handyman. As I'm sure you recall, Antonio is a PE teacher who joined us as a handyman but he's so wonderful with the children and understanding of our ethos that we have had to promote him to practitioner! We can't believe next week is August already. Where has the year gone? Very excitingly though it appears that lots of you are free to attend our Family BBQ on 11th August. We have delicious treats on the menu and a fantastic bubble show to keep the little ones amused. It should be great fun. As mentioned before, you are welcome to bring any siblings along with you. If you haven't already rsvp-ed, please do confirm if you are attending so we make sure you don't go hungry! Have a lovely weekend. If you have nothing planned then the bike race through Raynes Park/Wimbledon is always worth a visit. A fantastic community event with a great atmosphere. Maybe we will see you there. We hope you had a lovely weekend! Newer PostWimbledon - Woodland warriors!